Los Angeles (December 2013): Winter is a time of shimmer and shine. Frost glistens on windows, lights twinkle in the night and decorations adorn doorways. This January, give your nails a shine all their own with Crinkled Chrome from China Glaze®. High-shine chrome meets wintery pastels in this crinkled metal look. China Glaze® nail lacquers are available through salons and professional beauty supply stores nationwide. 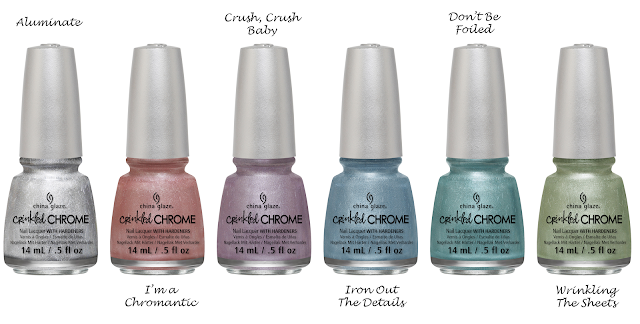 For more information, please visitwww.chinaglaze.com or follow China Glaze on Facebook (@ChinaGlaze), Twitter (@ChinaGlazeOfficial) and Pinterest (pinterest.com/chinaglaze).